The Republic of North Ossetia – Alania (Russian: Республика Северная Осетия — Алания, tr. Respublika Severnaya Osetiya — Alaniya, IPA: [rʲɪˈspublʲɪkə ˈsʲevʲɪrnəjə ɐˈsʲetʲɪjə ɐˈlanʲɪjə]; Ossetian: Республикӕ Цæгат Ирыстон — Алани, Respublikæ Cægat Iryston — Alani, Ossetian pronunciation: [resˈpublikə t͡səˈgät iɾɨˈʃton äˈläni] listen (help·info)) is a federal subject of Russia (a republic). Its population according to the 2010 Census was 712,980. Its capital is the city of Vladikavkaz. In the last years of the Soviet Union, as nationalist movements swept throughout the Caucasus, many intellectuals in the North Ossetian ASSR called for the revival of the name of Alania, a medieval kingdom of the Alans. The term of "Alania" quickly became popular in Ossetian daily life through the names of various enterprises, a TV channel, political and civic organizations, publishing house, football team, etc. In November 1994, the name of "Alania" was officially added to the republic's title (Republic of North Ossetia – Alania). Map of the Republic of North Ossetia – Alania. North Ossetian landscape, kwyrttaty kom. The republic is located in the North Caucasus. The northern part of the republic is situated in the Stavropol Plain. 22% of the republic's territory is covered by forests. All of the mountains located on the territory of the republic are a part of the Caucasus. Mount Kazbek is the highest point (5,033 m), with Mount Dzhimara being the second-highest (4,780 m). Natural resources include minerals (copper, silver, zinc), timber, mineral waters, hydroelectric power, and untapped reserves of oil and gas. Average annual precipitation: 400–700 millimeters (16–28 in) in the plains; over 1,000 millimeters (39 in) in the mountains. Political map of the Caucasus region in 1060. 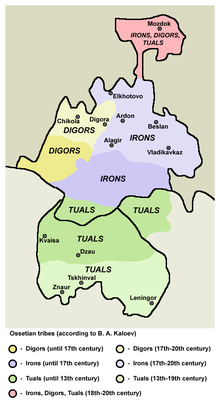 Ossetian tribes (both North and South) according to B. A. Kaloev. The territory of North Ossetia was first inhabited by Caucasian tribes. Some Nomadic Alans settled in the region in the 7th century, forming the kingdom of Alania. It was eventually converted to Christianity by missionaries from Byzantium. Alania greatly profited from the Silk Road which passed through its territory. After the Middle Ages, the Mongols' and Tartars' repeated invasions decimated the population, now known as the Ossetians. Islam was introduced to the region in the 17th century by Kabardians. Conflicts between the Khanate of Crimea and the Ottoman Empire eventually pushed Ossetia into an alliance with Imperial Russia in the 18th century. Soon, Russia established a military base in the capital, Vladikavkaz, making it the first Russian-controlled area in the northern Caucasus. By 1806, Ossetia was under complete Russian control. Border changes after World War I. The Russians' rule led to rapid development of industry and railways which overcame its isolation. The first books from the area came during the late 18th century, and became part of the Terskaya Region of Russia in the mid-19th century. The Russian Revolution of 1917 resulted in North Ossetia being merged into the Mountain Autonomous Soviet Socialist Republic in 1921. It then became the North Ossetian Autonomous Oblast on 7 July 1924, then merged into the North Ossetian Autonomous Soviet Socialist Republic on 5 December 1936. In World War II, it was subject to a number of attacks by Nazi German invaders unsuccessfully trying to seize Vladikavkaz in 1942. The North Ossetian ASSR declared itself the autonomous republic of the Soviet Union on 20 June 1990. Its name was changed to the Republic of North Ossetia – Alania in 1994. The dissolution of the Soviet Union posed particular problems for the Ossetian people, who were divided between North Ossetia, which was part of the Russian SFSR, and South Ossetia, part of the Georgian SSR. In December 1990, the Supreme Soviet of Georgia abolished the autonomous Ossetian enclave amid the rising ethnic tensions in the region, which was further fanned by the Moscow; a lot of the conflict zone population, faced with the ethnic genocide, was forced to flee across the border to either North Ossetia or Georgia proper. Some 70,000 South Ossetian refugees were resettled in North Ossetia, sparking clashes with the predominantly Ingush population in the Prigorodny District, which sparked the Ossetian–Ingush conflict. As well as dealing with the effects of the conflict in South Ossetia, North Ossetia has had to deal with refugees and the occasional spillover of fighting from the wars around them. In recent years, North Ossetia – Alania's economic development has been successful; the indicators of the republic's social and economic development in 2005–2007 revealed a stable growth of all sectors of the economy and major social parameters. The nature and climatic conditions of the republic contribute to the successful development of various economic sectors, which is compounded by the abundance of natural resources. Gross regional product pro capita of the region in 2006 was 61,000 rubles ($2,596) and increased 30% in the 2005–2007 time period. GRP pro capita in 2007 was 76,455 rubles. In 2005–2007, the average monthly wage in North Ossetia – Alania doubled, with the actual cash earnings increased by 42.5 percent. In terms of the average monthly wage growth, the Republic ranks first in the North Caucasus. The regional government's economic priorities include industrial growth, development of small enterprise, spas, and resorts, and strengthening the budgetary and tax discipline. The largest companies in the region include Elektrozinc, Sevkavkazenergo, Pobedit (tungsten and molybdenum producer). The most widespread resources are zinc- and lead-containing complex ores. There are deposits of limestone, dolomites, marble, and touchstone. There is also a large availability of construction materials, such as clay, sand, and gravel. The local oil deposit reserves are estimated at 10 million metric tons. The agricultural sector is varied and specializes in the cultivation of wheat, corn, and sunflowers; horticulture; viticulture; and cattle and sheep breeding. North Ossetia's industry is mainly concentrated in Vladikavkaz. Major companies located here include Elektrotsink, Gazoapparat, an instrument-making plant, Elektrokontraktor, a factory producing automotive electrical equipment, a large-panel construction complex, and companies in the food industry. The Sadonsky industrial center has grown around the mining and forest industries. Despite the proximity to Chechnya, North Ossetia is making efforts to develop its tourist industry. Projects under a program for spa, resort, and tourism development have been successfully implemented in the mountainous part of the republic, according to the head of the regional government. There are nearly 3,000 historical monuments in the Republic and more than half of its area is occupied by Alania National Park, the North Ossetia National Preserve, and game preserves. There are more than 250 therapeutic, mineral, and freshwater springs in the republic with estimated daily reserves of 15,000 cubic meters. Besides providing the basis for health spas, these mineral waters also have the potential to be bottled and sold. North Ossetian mineral waters are known for their unique qualities, as well as special mineral composition. In terms of its infrastructure, North Ossetia – Alania ranks second in the Southern Federal District and 10th in the nation. The republic has some of the most extensive telecommunication networks in the North Caucasus region and in Russia. It ranks first in terms of its telecom network installations in the Southern Federal District. The republic ranks fourth in Russia in terms of its paved roads, and its expanding transport and logistics complex provides communication networks between Russia and the South Caucasus, as well as Central Asia. The complex includes two federal highways (Georgian Military Road connects Vladikavkaz with Transcaucasia) running across the Greater Caucasus Range, two customs checkpoints for cars, a developed railway network, Vladikavkaz international airport, and well-equipped transport terminals. Population: 712,980 (2010 Census); 710,275 (2002 Census); 634,009 (1989 Census). The majority of the population of North Ossetia are Christians who belong to the Russian Orthodox Church, although there is also a Muslim minority who are of Ossetian-speaking origin. According to the 2010 Census, Ossetians make up 65.1% of the republic's population. Other groups include Russians (20.8%), Ingush (4.0%), Armenians (2.3%), Kumyks (2.3%), Georgians (1.3%), Ukrainians (0.4%), Chechens (0.3%), and Caucasus Greeks (0.2%). 1 The results of the 1926 census refer to the present territory, which is a combination of the North Ossetian AO, the city of Vladikavkaz and adjacent areas. 2 6,557 people were registered from administrative databases, and could not declare an ethnicity. It is estimated that the proportion of ethnicities in this group is the same as that of the declared group. There are two official languages in North Ossetia – Russian, which is official in all Russian territory, and Ossetian. Ossetian is an Indo-European language, belonging to the East Iranian group. Russian, acting as a lingua franca in the region, but also native to many, is an East Slavic language and as such also belongs to the Indo-European family, which means the two languages are related, albeit distantly. According to a 2012 survey which interviewed 56,900 people, 49% of the population of North Ossetia – Alania adheres to the Russian Orthodox Church, 10% declare to be unaffiliated Christian believers, 2% are either Orthodox Christian believers who do not belong to churches or members of non-Russian Orthodox bodies. The second-largest religion is Ossetian ethnic religion, generally called Uatsdin (Уацдин, "True Faith"), a Scythian religion organized into movements such as the Atsætæ Church, comprising 29% of the population. Muslims constitute 4% of the population, and Protestants the 1%. In addition, 1% of the population declares to be "spiritual but not religious" and 3% to be atheist. Seat of the Republic's Government. During the Soviet period, the high authority in the republic was shared between three people; the first secretary of the North Ossetia Communist Party of the Soviet Union (CPSU) Committee (who in reality had the biggest authority), the chairman of the oblast Soviet (legislative power), and the Chairman of the Republic Executive Committee (executive power). Since 1991, CPSU lost all the power, and the head of the Republic administration, and eventually the governor was appointed/elected alongside elected regional parliament. The Charter of the Republic of North Ossetia – Alania is the fundamental law of the region. The Parliament of North Ossetia–Alania is the republic's regional standing legislative (representative) body. The Legislative Assembly exercises its authority by passing laws, resolutions, and other legal acts and by supervising the implementation and observance of the laws and other legal acts passed by it. The highest executive body is the Republic's Government, which includes territorial executive bodies such as district administrations, committees, and commissions that facilitate development and run the day to day matters of the province. The Oblast administration supports the activities of the Governor who is the highest official and acts as guarantor of the observance of the krai Charter in accordance with the Constitution of Russia. The head of government in the Republic of North Ossetia – Alania is the Head of the Republic. As of 2008, the head of the republic is Taymuraz Mamsurov. Mamsurov succeeded Alexander Dzasokhov, who voluntarily quit his post on May 31, 2005. The most important facilities of higher education include North Caucasus State Technological University, North Ossetian State University, North Ossetian State Medical Academy, and Mountain State Agrarian University—all in Vladikavkaz. There are six professional theaters in North Ossetia – Alania, as well as Ossetian State Philharmonia. ^ Shnirelman, Victor (2006). The Politics of a Name: Between Consolidation and Separation in the Northern Caucasus. Acta Slavica Iaponica 23, pp. 37–49. ^ a b c d e "North Ossetia–Alania: social and economic indicators looking up". Moscow News. September 18, 2008. Archived from the original on March 4, 2009. Retrieved August 30, 2008. ^ a b "Republic of North Ossetia–Alania: Introduction". Russia: All Regions Trade & Investment Guide. CTEC Publishing LLC. 2008. Archived from the original on July 15, 2011. ^ "North Ossetia–Alania". Microsoft Encarta. Archived from the original on November 1, 2009. Retrieved June 4, 2009. ^ a b c "Republic of North Ossetia". Kommersant. March 11, 2004. Archived from the original on January 5, 2009. Retrieved June 4, 2009. ^ a b "Republic of North Ossetia". Russia Profile. August 25, 2008. Archived from the original on December 4, 2008. Retrieved June 4, 2009. ^ В 2008 году естественный прирост населения Северной Осетии составил более 2 тыс. человек – Новости России – ИА REGNUM. Regnum.ru (2009-02-26). Retrieved on 2012-08-18. ^ население северной осетии. Ethno-kavkaz.narod.ru. Retrieved on 2012-08-18. ^ Перепись-2010: русских становится больше. Perepis-2010.ru (2011-12-19). Retrieved on 2012-08-18. ^ "Regional government to quit over Beslan tragedy: president". ABC News. Парламент Республики Северная Осетия — Алания. Закон №520А от 24 ноября 1994 г. «О государственном гимне Республики Северная Осетия — Алания», в ред. Закона №44-РЗ от 31 июля 2006 г «О внесении изменений в Закон Республики Северная Осетия — Алания "О государственном гимне Республики Северная Осетия — Алания"». Опубликован: Газета "Северная Осетия". (Parliament of the Republic of North Ossetia – Alania. Law #520A of November 24, 1994 On the State Anthem of the Republic of North Ossetia – Alania, as amended by the Law #44-RZ of July 31, 2006 On Amending the Law of the Republic of North Ossetia – Alania "On the State Anthem of the Republic of North Ossetia – Alania". ). This page was last edited on 23 March 2019, at 19:55 (UTC).